Rural women play a critical role in the rural economies of both developed and developing countries. Women in rural areas, whose survival depends mainly on natural resources and agriculture, make up more than a quarter of the world's population. In developing countries, rural women constitute nearly 43 percent of the total workforce in agriculture. They produce and process most of the available food, which has the primary responsibility for food safety. Bearing in mind that 76 percent of the extremely poor live in rural areas, secured access to productive agricultural resources to women in the village contributes to reducing global hunger and poverty, which rural women receive key to the success of the new Agenda for sustainable development by 2030. On this background, the International Conference “Women in Rural Areas and Cross-border Cooperation” was held on the 6th March 2017 in Novi Sad (Agenda). More than 120 people attended the conference to talk about the challenges as well as the opportunities for women in rural areas. István Pásztor, President of the Assembly of the Autonomous Province of Vojvodina, opened the Conference with a speech about the importance of this Event. He explained that every topic as it owns, rural areas, Cross-border cooperation, and women, is important. But all three topics combined to one are more than crucial to discuss. Pásztor greeted also all the experts and participants for their coming and wished an interesting and productive day. The next speaker was Ann-Sofi Backgren, First Vice President of the Association of the European Border Regions, who was not able to take part in person but sent a video. She emphasized again the importance of this conference and apologized for her absence but was more than willing to attend to the next conference like this. Backgren shared her own experiences in this topic and marked out the weight of rural women taking part in three different levels: politics, NGOs and starting their own business. Often, they don´t want to, but they should get active, so they can make a change of their situation and their circumstances. Ana Milenić, program manager for human right and gender equality from the Delegation of the European Union Serbia followed next. Her speech was strongly connected to the European Union and the different European Funds for funding projects. She presented several possibilities for women, and especially women in rural areas, to apply for projects, that are mostly published and funded by the EU Delegation. Sanda Šimić, who is Assistant Director of the Serbian European Integration Office of the Government of the Republic Serbia, pointed out the different opportunities for cross-border projects that the Serbian European Integration Office is managing. Serbia is eligible in total for 9 different programs. 7 of these are CBC programs with the neighboring countries and two are at a national level and all are funded through IPA. The coordinator of the Women´s Parliamentary Network of the Assembly of the AP Vojvodina, Maja Sedlarević, finished the opening ceremony. She mentioned again the significance of women taking part in politics. Therefore, she explained the role of the Women´s Parliamentary Network and the work of this network. Sedlarević gave also an overview of the different position women have in politics, for example in parliaments. At the end of this first session, the topic of the conference was cleared out and everyone was prepared for the following presentations of the invited experts. The second session was opened by Ana Nikolov, AEBR Coordinator for Balkans, CESCI Director of planning and ICBC Institute Director with the topic “Position of Women in Rural Areas – Mainstreaming gender Equality in Cross-border Rural Development”. The first speaker was Indrani Das Schmid, CEO of the Gesellschaft zur Förderung der grenzüberschreitenden Zusammenarbeit in Switzerland. She showed the participants several statistics from women in rural areas of Germany, Austria, and Switzerland. It was seen that most of the women, who are living in rural areas, are only working in part-time because they have to take care of their children. Furthermore, Das Schmid explained that women in rural areas have a lack of additional skills, like computer skills, and it is not clear in which scope they are able to use these additional skills. In most of the cases, women in rural areas choose their role as a housewife by their self, because they cannot imagine another life and do not know about their possibilities. She concluded with a comparison to the situation in Serbia. Connecting to this, Dr. Ksenija Crnomarković, from the Department of Political Science of the University of Jena, Germany was giving a more specific image of the situation of the women in rural areas in Serbia. She pointed out that the situation in rural areas in Serbia is much worse than a lot of people think. Therefore, Crnomarković emphasized the lack of access to health care in general and especially to the gynecologist. Almost a third of Serbian women in rural areas have never been to a gynecologist. That´s why this conference is more than important to conquer these problems and to find solutions for giving women, living in rural areas, the chance of a safer better life. The third speaker was Nataša Gligorijević, who is not only the Director of the Center for Sustainable Development in Serbia but also AEBR Young Leader. As a co-initiator of the International Conference, she breathed a wish for a department for women. Within this Gligorijević pointed out the significance of women in higher positions at every political level, like NGOs, at a state level, and in the whole democracy process. On the next session, the topic was “Women in Agribusiness and Cross-Border Cooperation”, moderated by Nataša Gligorijević. The first speaker was Olivera Popovic, she is Vice president of Association of Business Women in Serbia and she talked about good examples for entrepreneurship and ownership of women in Serbia. For a good example, she used the city of Subotica and the project “Empowering women through entrepreneurship”. Next was Ivana Pajic, she is rural development expert from Serbia, she reached Serbian problems in rural areas about the traditional law because women give up the property in favor of a male heritage. She said the biggest problem have women working in agriculture because they aren’t entitled to maternity leave and the hardest position have women which are seasonal workers in agriculture. About agribusiness and good cross-border cooperation Grigoris Chatzikostas was talking, who is innovation and business development manager from BioSense Institute. He told that emerging industries are key enablers for the adoption of advanced technologies in the agrifood sector. As an example, Chatzikostas presented KATANA, which is an international project by BioSense. In detail, KATANA is a cluster-driven project, bringing together seven active partners from all over Europe (from Scandinavia to Mediterranean and Balkans) covering the entire ecosystem, namely agriculture, food production and emerging industries. The project was not specially designed for women but it gives a practical example, how women can take part in the business and can start their own business. Therefore, he presented three pillars that are covered by KATANA, selective and funding schemes, supporting service and technology. Within these pillars, SMEs can apply with their ideas to get financial help and training to improve their own business. With it, not only companies from the agrifood sector are included but also from the emerging industry and ICT/advanced technology sector. The last speaker in this session was Ana Nikolov, who spoke about good experiences of cross-border cooperation. She announced various new ERASMUS projects and the “Sarma Fest”, which will happen in September. “If we all do a little, a few years it will be much”, was Nikolov`s conclusion on this topic. At the end of the conference, there was a discussion about the topic between women from different social groups, several women noted their problems, for example, the “Association Golden Hands” has a problem which aimed a lack of financial resources and education. After the conference, the working group was held on empowering rural women. The working session was introduced by Indrani Das Schmid, who is the initiator of the establishment of Task Force for Gender. Also, the Task Force for Gender will be used to collect other opinions and experiences and share them on a central platform, like a website, where people can talk about their issues and search for solutions. In her speech, Das Schmid emphasized that the obstacles are real and women should not be afraid to speak them out loud and to look for solutions. After the introductory speech, participants spoke about the problems they face in their everyday life, regarding women in rural areas and cross-border cooperation. A lot of problems in general but also personal were mentioned. The biggest problem is, like in many other cases, the lack of financial resources and the funding. Many women don`t have the needed knowledge how to get funded or how to even apply for their project. In other cases, they have the resources but don`t know how to use them. It has quickly turned out that a first step to improving the situation of women in rural areas, is to train the people and to provide an access to important information for everyone. Another problem is the discrimination, many women have to face with at work or in their everyday life. It`s hard for a young woman, who is well-educated and an expert in a certain field to find a work in this field and to get accepted by their colleagues. Because of this, it`s crucial to think of ways to convince the women to stay in the region and don`t move away to bigger cities. The outcomes of the working group were an establishment of a common platform in form of a website, to improve the network-building and to make it easier for the women to find partners and information for their projects, making women in rural areas more visible and giving them a voice, and the preparation of upcoming meetings of the Task Force for Gender. Two foreseen projects will address the present problems, “SheStartUp” and “Women in Politics”. 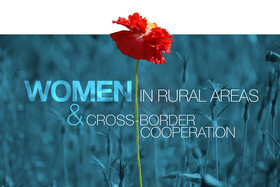 It can be said that the International Conference on “Women in Rural Areas and Cross-border Cooperation” has drawn attention to many obstacles and laid the foundation for following projects, which will challenge them.